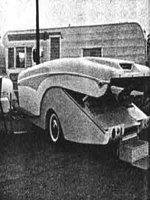 Teardrops n Tiny Travel Trailers • View topic - Fold Down Trailer? I've always liked your WW design and I always thought the Odyssey would be cool to re-create. Looking forward to seeing what you come up with. We've put lots of miles on the Sunhopper for 7 years now, but I think I'm finally ready for something a bit larger or some kind of pop up trailer. I've been trying to re-design the Sunhopper into a standy of sorts using SketchUp. Anyway, I'll be following this thread with interest. Building a quick model is a great idea. I'm going to do this. rm, not to hi-jack this forum. But, I just checked out your Sunhopper and really like the design of it.. great looking camper..
RMC… I like that S-cargo too … Cool !!! After some rainy day Studio cleaning , we found some Big graph paper and am going to try and make a scale drawing to build a cardboard model “Folder” ( plus boat) from … Just to get the basic idea of what to expect, how it works … It seems simple , but there’s always something that needs “adjustment” and a drawing then scale model will help us visualize that . I’m starting with the idea of a 10' X 4’ cabin , which would make a marginally wide camper trailer and a very wide Boat ( should be really Stable in the water). Yet still not be Too Big to handle . I don’t know HOW I missed this! I have been planning (obsessing) over this design for a few years now. As already stated the front lifts straight up about 24 inches and THEN the hinge opens. There were two different designs of the ”original” Odyssey camper that appeared to use different lifting mechanisms for the front. Both utilized springs on the split rear walls to assist in raising the door/wall section. I’m sitting on a 10 ft tandem axle trailer frame trying to make this design work. It’s all been in my head so far but I go to sleep every night imagining ways to make this design a reality. Can’t wait to see what other minds come up with! I hope these files are not too big. It’s been a while since I posted pics.